The gallery showcases a select number of out of print artist books. Beyond Blue, 2016. Embroidered text spooled on a seal's knuckle bone, beaded salmon leather box lined with indigo dyed cotton. Agate and embroidered map on indigo dyed cotton included. Mother's Measure, 2015. Two embroidered poems, one subtracted from the other, about my mother's sewing. Lost In Japan, 1999. A collection of micro-memoir pieces, poem, and phonebook, letterpress printed and folded into a scrapbook between sewn-in vintage Japanese papers along with maps, Japanese language book pages, a gingko leaf, and prints from coins and a gingko leaf. 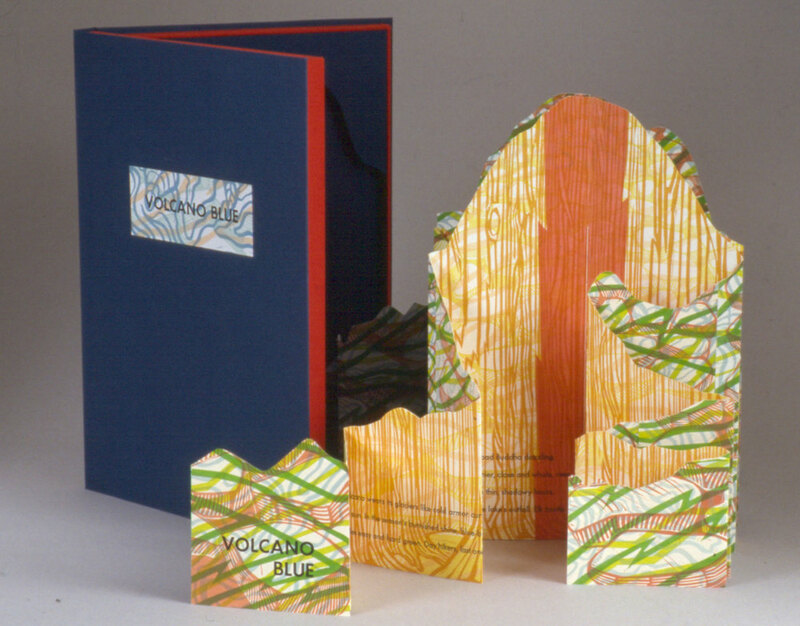 Volcano Blue, 1998. Created on commission by Seafirst Gallery to celebrate the centennial of Mr. Rainier National Park. Made in collaboration with Ann Spiers and Kim Newall.